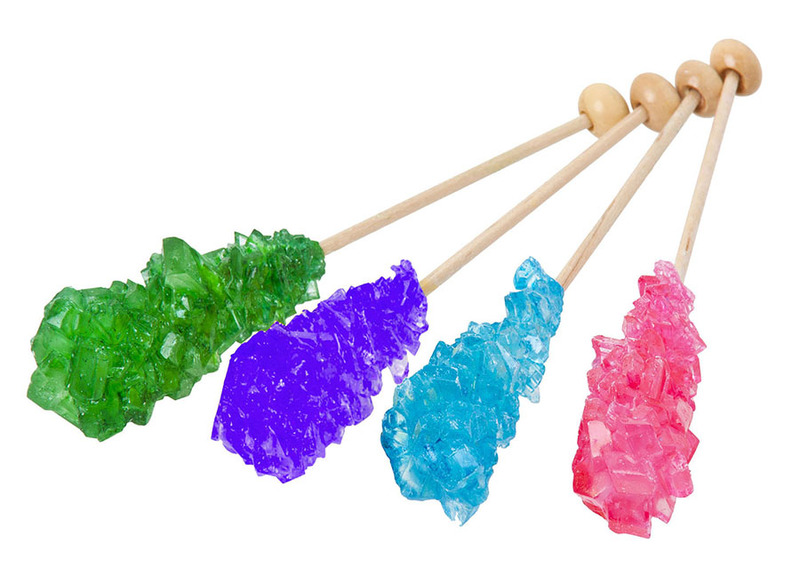 Making delicious rock candy at home is a fun and good science experiment. It will help you to understand saturated and supersaturated solutions. You will love to see how crystals grow on a wooden stick as time passes. You can taste and eat the crystal that you will make. Precaution: Always wear safety goggles and hand gloves when dealing with chemicals. Also, take the permission from your parents for the experiment, or involve them. Wet the Wooden Skewer in water, then roll it on the sugar crystals. Then, make sure that granules of sugar have stick on the surface of the skewer. Place the Skewer aside and let it dry completely so that granules of sugar firmly stick to it. If sugar does not firmly stick to Skewer, it will fall in the glass and crystallization will not take place. Boil 2 cups of water into a pan. Add a half cup of sugar to the boiling water while stirring. Keep adding more sugar to the pan until it stops to dissolve further. Note: Each time you add sugar to the pan, it will take time to dissolve it so be patient and keep stirring. Pour the hot sugar solution into the glass and fill it completely. Clip the dry end of Wooden Skewer into the clothespin near to the spring. Now gently place the Wooden Skewer in the hot sugar solution by putting clothespin at the mouth of the glass. Put a piece of paper on top of the glass, and place it in a safe place to cool-down. The sugar crystals will start to grow, and it may take 3-7 days to complete the process. When sugar is dissolved in water at room temperature, it has specific point after which the sugar will nor dissolve further. This point is called saturation point. When sugar stops to dissolve further in the water then it is said to be a saturated solution. When you heat that solution at boiling point, you further dissolve more sugar. Again, a point will reach where sugar will not dissolve further, then the solution will be called supersaturated solution. You made the supersaturated solution and placed it to cool. When this solution becomes cool, it becomes unstable, and sugar starts to form crystals in solution. The sugar granules that were stuck on the Wooden Skewer are served as seed crystals on which dissolved sugar will cling to form crystals. Try to add food coloring to the solution for colored rock candy. If you want to make several candies of different colors. Use different glass for each color. You can make sugar and water solution in one container. Then, mix the color separately in each glass. Abdul Wahab, "How to Make Rock Candy at Home," in Science4Fun, April 13, 2019, http://science4fun.info/how-to-make-rock-candy-at-home/.